Rockefeller Center is home to some of the best places for kids in NYC—from the Rink to Top of the Rock—and this coming weekend offers a free, extra-special event for the tykes in your life. Spring Sunday 2019, on April 14 from 1–4pm, will bring live music by the Grammy-winning Dan Zanes + Claudia Eliaza, book readings by Brandon Stosuy (author of We Are Music and Music Is) and a magic show from FAO Schwarz, with an appearance from the shop's Toy Soldiers and mascots Penelope and Patrick. Meanwhile, artist in residence Hein Koh will lead a hands-on workshop called "The Garden of Just Delighful," and all the art created during the session will go on display in the Concourse in the coming weeks. Paper Source, The Shop at NBC Studios and Bluprint will also be hosting craft workshops, face painting and a photo booth, plus snacks and treats will be for sale from Sugarfina, Jacques Torres, Harry's Italian, Ben & Jerry's and other Rock Center shops. Spring Sunday, produced in partnership with Art Production Fund, is free and open to the public, with no reservations required. 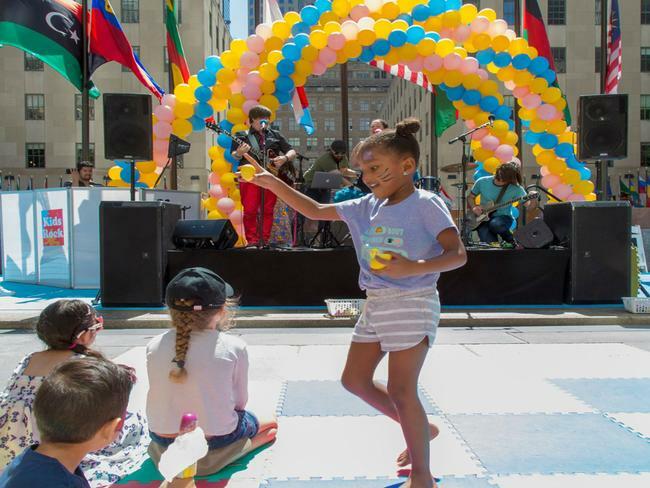 Join the fun at Rockefeller Plaza (between West 49th and 50th Streets and Fifth and Sixth Avenues) on April 14 (1–4pm), and see a map of Rockefeller Center here. For more family activities this season, check out the Spring Break Special at the Rink (offering discounts for kids 10 and under through April 25), brunch and ice skating on Easter, and Easter-themed happenings at FAO Schwarz. The launch of of Frieze Sculpture at Rockefeller Center at the end of April will also bring events to spark young imaginations, and registration is now open for free family tours and workshops.